I wanted to have a good blogging schedule where I could take part in the challenges I love every month. And I was doing well, until June and then the wheels fell off the bus. For various reasons I just did not get around to last month’s mingle which was hosted by the founder Meeta. It was a granola challenge and I could have just reposted my very delicious recipe but I did not feel that it met the requirements. I have wanted to make rusks for a very long time. They are, in my opinion, South Africa’s answer to the Italian biscotti. These twice baked treats are so easy to make, but I have never tried baking them before. They make the best breakfast snack and I am going to ensure there are always some to hand. 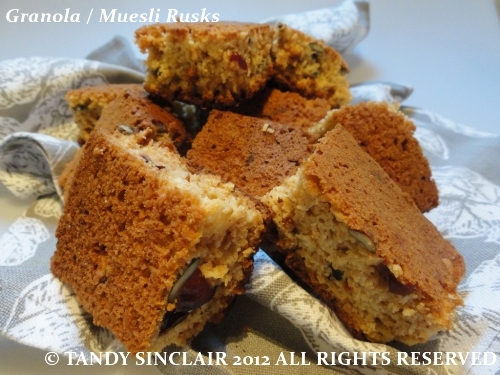 I took 3 rusk recipes and combined and tweaked them all to make this one for Granola Muesli Rusks my own. It has some of the same ingredients you will find in my granola, and they are a healthy alternative for a tea time treat. Do you have a schedule you try to stick to? Stir in your choice of the cranberries etc. This sounds delicious!! I love home made muesli anything!!! I have been thinking of making Rusks again. They are so handy when we go camping. I seem to have dropped off your mailing list – will resubscribe and catch up!